The late evening of Aug. 9, 2014, I couldn’t sleep. I was due to substitute-anchor MSNBC’s “UP with Steve Kornacki” and should have been asleep. But after looking at my Twitter feed and reading the rage under #Ferguson, I felt compelled to type a reaction to the killing of Michael Brown by police officer Darren Wilson. Tying the shooting to the inane whine of certain politicians about a “war on whites,” I decried the next morning the death of yet another unarmed black man at the hands of a white police officer. 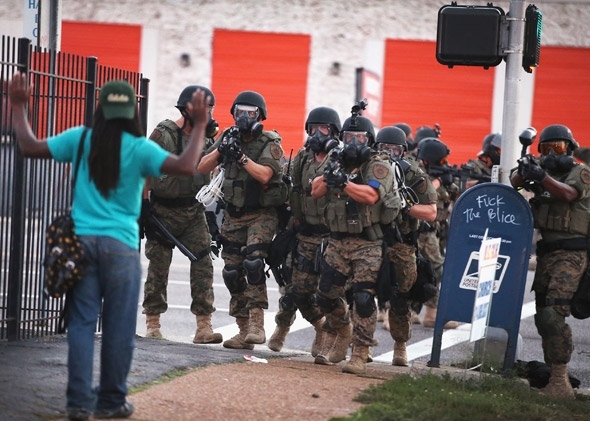 The report on the Ferguson police department detailed abuse and blatant trampling of the constitutional rights of people, mostly African Americans, in Ferguson. Years of mistreatment by the police, the courts and the municipal government, including evidence that all three balanced their books on the backs of the people of Ferguson, were laid bare in 102 damning pages. The overwhelming data from DOJ provided background and much-needed context for why a small St. Louis suburb most had never heard of exploded the moment Brown was killed. His death gave voice to many who suffered in silence. The unarmed 18-year-old also became a potent symbol of the lack of trust between African Americans and law enforcement. Not just in Ferguson, but in the rest of the country. Lord knows there have been plenty of recent examples. And the militarized response to protesters by local police put an exclamation point on demonstrators’ concerns. But the other DOJ report, the one on the actual shooting of Michael Brown, shows him to be an inappropriate symbol. Page 6: Wilson and other witnesses stated that Brown then reached into the SUV through the open driver’s window and punched and grabbed Wilson. This is corroborated by bruising on Wilson’s jaw and scratches on his neck, the presence of Brown’s DNA on Wilson’s collar, shirt, and pants, and Wilson’s DNA on Brown’s palm. While there are other individuals who stated that Wilson reached out of the SUV and grabbed Brown by the neck, prosecutors could not credit their accounts because they were inconsistent with physical and forensic evidence, as detailed throughout this report. Page 6: Brown then grabbed the weapon and struggled with Wilson to gain control of it. Wilson fired, striking Brown in the hand. Autopsy results and bullet trajectory, skin from Brown’s palm on the outside of the SUV door as well as Brown’s DNA on the inside of the driver’s door corroborate Wilson’s account that during the struggle, Brown used his right hand to grab and attempt to control Wilson’s gun. According to three autopsies, Brown sustained a close range gunshot wound to the fleshy portion of his right hand at the base of his right thumb. Soot from the muzzle of the gun found embedded in the tissue of this wound coupled with indicia of thermal change from the heat of the muzzle indicate that Brown’s hand was within inches of the muzzle of Wilson’s gun when it was fired. The location of the recovered bullet in the side panel of the driver’s door, just above Wilson’s lap, also corroborates Wilson’s account of the struggle over the gun and when the gun was fired, as do witness accounts that Wilson fired at least one shot from inside the SUV. Page 8: Although there are several individuals who have stated that Brown held his hands up in an unambiguous sign of surrender prior to Wilson shooting him dead, their accounts do not support a prosecution of Wilson. As detailed throughout this report, some of those accounts are inaccurate because they are inconsistent with the physical and forensic evidence; some of those accounts are materially inconsistent with that witness’s own prior statements with no explanation, credible [or] otherwise, as to why those accounts changed over time. Certain other witnesses who originally stated Brown had his hands up in surrender recanted their original accounts, admitting that they did not witness the shooting or parts of it, despite what they initially reported either to federal or local law enforcement or to the media. Prosecutors did not rely on those accounts when making a prosecutive decision. While credible witnesses gave varying accounts of exactly what Brown was doing with his hands as he moved toward Wilson – i.e., balling them, holding them out, or pulling up his pants up – and varying accounts of how he was moving – i.e., “charging,” moving in “slow motion,” or “running” – they all establish that Brown was moving toward Wilson when Wilson shot him. Although some witnesses state that Brown held his hands up at shoulder level with his palms facing outward for a brief moment, these same witnesses describe Brown then dropping his hands and “charging” at Wilson. The DOJ report notes on page 44 that Johnson “made multiple statements to the media immediately following the incident that spawned the popular narrative that Wilson shot Brown execution-style as he held up his hands in surrender.” In one of those interviews, Johnson told MSNBC that Brown was shot in the back by Wilson. It was then that Johnson said Brown stopped, turned around with his hands up and said, “I don’t have a gun, stop shooting!” And, like that, “hands up, don’t shoot” became the mantra of a movement. But it was wrong, built on a lie. Yet this does not diminish the importance of the real issues unearthed in Ferguson by Brown’s death. Nor does it discredit what has become the larger “Black Lives Matter.” In fact, the false Ferguson narrative stuck because of concern over a distressing pattern of other police killings of unarmed African American men and boys around the time of Brown’s death. Eric Garner was killed on a Staten Island street on July 17. John Crawford III was killed in a Wal-Mart in Beavercreek, Ohio, on Aug. 5, four days before Brown. Levar Jones survived being shot by a South Carolina state trooper on Sept. 4. Tamir Rice, 12 years old, was killed in a Cleveland park on Nov. 23, the day before the Ferguson grand jury opted not to indict Wilson. Sadly, the list has grown longer. Now that black lives matter to everyone, it is imperative that we continue marching for and giving voice to those killed in racially charged incidents at the hands of police and others. But we must never allow ourselves to march under the banner of a false narrative on behalf of someone who would otherwise offend our sense of right and wrong. And when we discover that we have, we must acknowledge it, admit our error and keep on marching. That’s what I’ve done here.